This has been quite the wet Fall thus far. This morning, I was awakened by the sounds of my 4 year old opening the fridge. I then could hear the rain coming down and knew it was going to be one of those wet, but energetic days. Pickle came to lay in bed with Poppy and I. Though I had only slept about 4 hours in total, I felt pretty good. We went through our normal routine and headed to school. At school, some of the other kids were playing in the rain. My mind goes straight to Peppa Pig and muddy puddles. I remember a time when I enjoyed jumping in puddles. Not that I wouldn’t do it now, but now my mind says jumping in puddles = catching a cold = cranky kids. Funny how your thought process changes. At the same time, the kids need to experience things, even if that means soaking their pants from the knees down. I really need to get them some rain boots. Anyway, after Pickle went into school, I headed to Poppy’s 9 month well check. I’m not going to lie, I purposely scheduled it during school hours so I wasn’t trying to entertain both kids in the small doctors office. We get there and check in. The nurse does all her vitals and asks a ton of questions. Then we wait. Normally the doctor comes in within 5-10 minutes. This time, we waited 30 minutes! I thought it was especially weird since there wasn’t any other patients in the waiting area. I wasn’t in a hurry though, so I just sat there watching Poppy destroy the paper roll they put on the bed. She was loving it. After the appointment, we headed back home. I was hungry and she was tired. She fell asleep in the car. For the first time ever, she stayed asleep as I got her out and carried her inside to her crib. 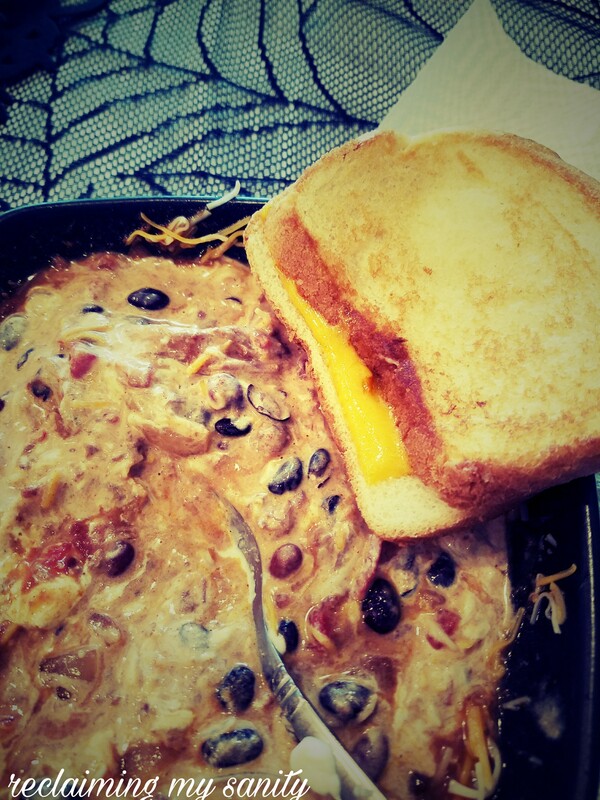 I made left over chili from last night and a grilled cheese. So good! Probably one of my favorite chili recipes yet. 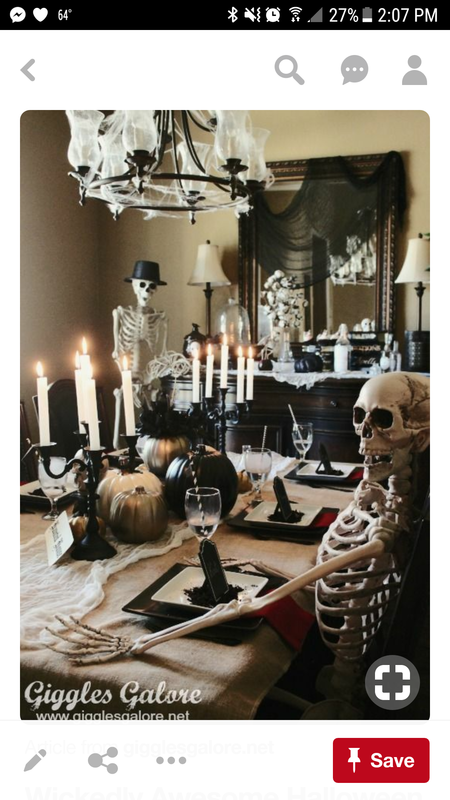 I was sitting there eating, enjoying the Halloween decorations. This year the dollar store had some really great finds! 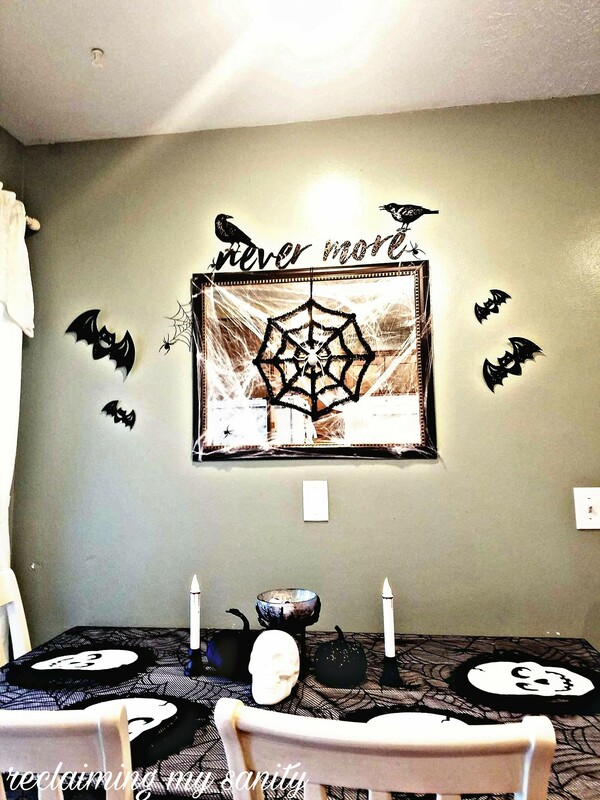 I had seen some pictures on Pinterest for ideas on Halloween dining room ideas. Let me show you a snapshot of what I was aiming for. 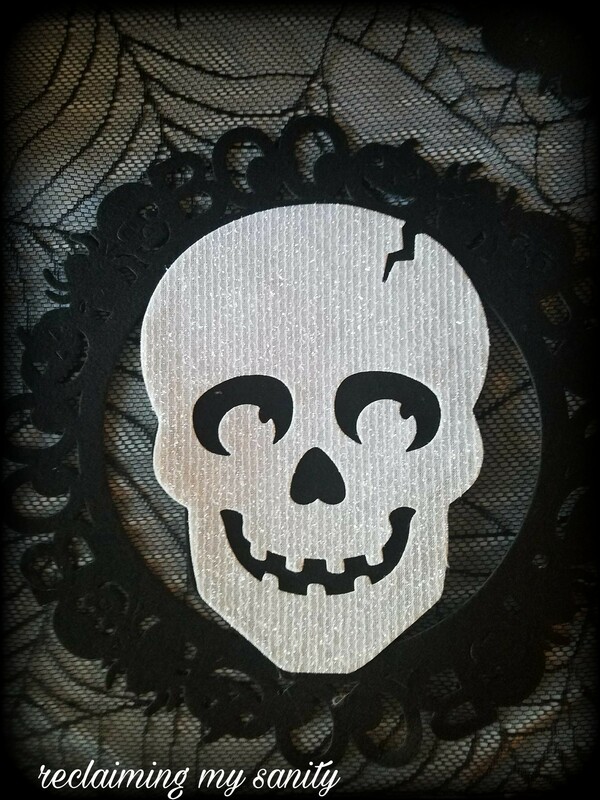 I thought it looked so cool with black and white and the skeletons. Though, knowing my cats and children, the more elaborate the more likely it gets ruined. I wanted a simpler version of it. We went to the dollar store (because who doesn’t love paying less for cool stuff?). For instance, spider webbing. You can either pay $1 at the dollar store or $3 At Target. Now, I love Target, but it is the same product, why not save a few dollars? 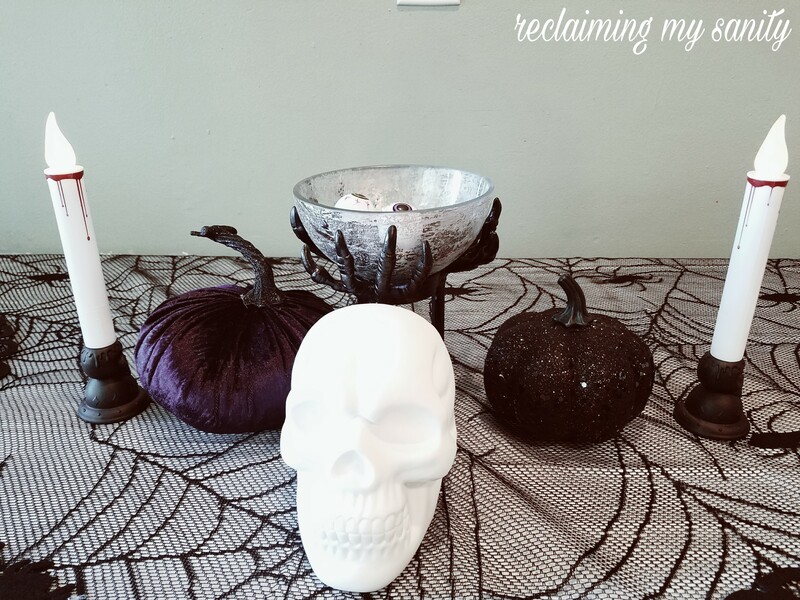 These bloody candle sticks, eyeballs, and black pumpkin. The spider web that is hanging on the mirror and the bats. I also found black and purple roses. I wound up putting them in the living room with an eyeball filled mason jar. I also decorated the corner cube shelf in the living room (since we don’t have our faux fireplace anymore). It is hard to see, but there is a pumpkin and skeleton that light up inside the cubes (both were dollar store finds that Pickle picked out last month). I’m not done yet, I still have to go get the box from the shed that has more stuff in it. Plus put up the 2 inflatables out front. 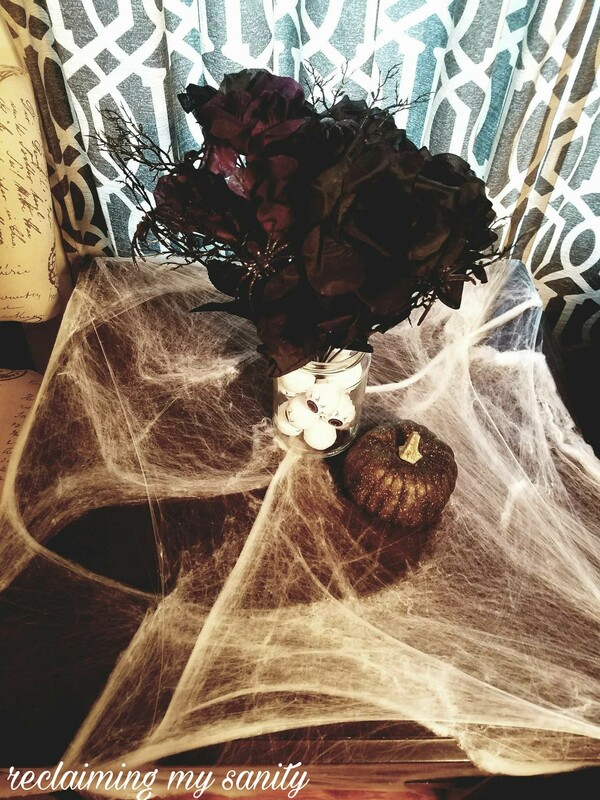 I figured this year, I would rather decorate the inside more than the outside since our neighborhood doesn’t have many participants in trick r treating. That way, I at least get to enjoy it and see it more than I see the front yard. 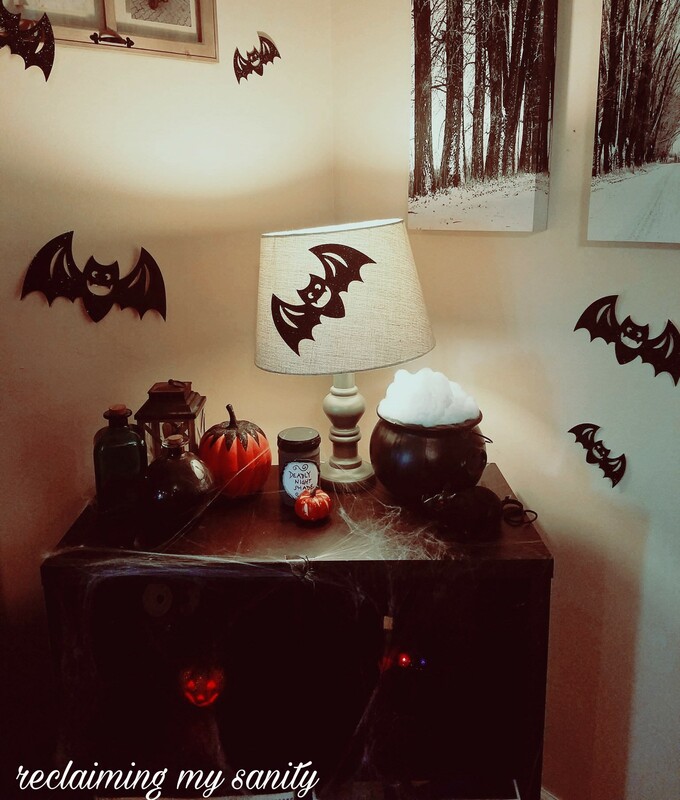 What do your indoor decorations look like? Anywho, I have to wake Poppy to go get Pickle from school. I hope you’re all having a lovely day!